Today is Thanksgiving here in America, and last year I did a Thanksgiving-themed 1860s ball gown as a reference to the year the holiday was established. But in 1939, in the middle of the Great Depression, President Franklin D. Roosevelt pushed it up a week so that there would be a longer shopping period between Thanksgiving and Christmas. As you might imagine, this didn’t go over well with everyone at the time, but for my purposes I am imagining my dolls to be early adopters. 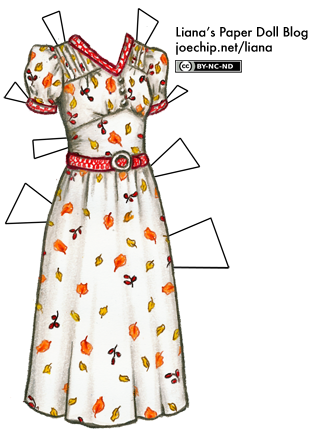 So this year, we have a 1939-style dress with an autumn leaf pattern to celebrate Thanksgiving. Do I ever feel like I have a lot to be thankful for this year! My husband, my family, my friends, the entire medical establishment — I could really go on and on. I won’t bore you all, though, but rather will leave you with one piece of new information: we went in for the ultrasound yesterday, and it’s a boy! I hope that those of you who celebrate Thanksgiving today will have a lovely one! I love the dress! And congratulations on having a boy – you are going to be an awsome parent! This dress is beautiful!!! Also congratulations!!! Happy Thanksgiving, and congratulations on your little boy; I know you can’t wait to meet him. Congratulations on the baby boy!!! Any name ideas yet? You must be so thrilled! And happy Thanksgiving to you!!! As usual, I love the dress, I do not think you have done one that I do not admire, they are all so lovely! Happy Thanksgiving. Congratulations. Love the dress. You must be so excited! I’m really happy for you. :) I’m sure he’ll be an adorable little boy! Congrats liana!!! That’s so exciting! The dress is very pretty and origanal! I would wear it if I lived back then! What a lovely Thanksgiving dress! A boy – he will give you much joy. Happy Thanksgiving to you too Liana! Congradulations on the baby boy! I hope everything goes perfectly for you. I think you did a good job capturing the time period on the dress! Congrats on all your good news. The dress is lovely. There is something wonderfully lady-like about the 1930’s dresses. Will you make guy paper dolls for you son? My artwork and story blog: http://bluejasmine.weebly.com/ AKA Blue Jasmine Blog. Aw! so excited for you! got a name yet? are you gonna do a christmas dress? I think that dress is really cute! Congratulations also.